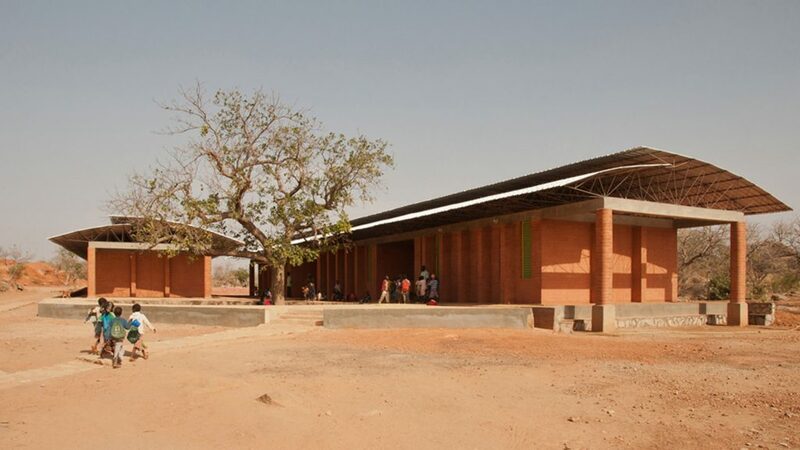 Francis Kéré’s award-winning, environmentally sustainable, natural and living conditions adapted architecture, functions according to the principles of the low-cost construction: A construction model is developed that is not only adapted to climatic, but also to locally available potential uses – both the traditional building materials as well as the existing workforce. During the construction period of his buildings, Kéré attaches great importance to the dissemination of knowledge about the professional use of the materials and construction techniques to the local workers. Education was also a major issue for Christoph Schlingensief and is an integral part of construction of Operndorf Afrika. All what the local workers need to be taught is the use of a hand saw and a small welding machine. 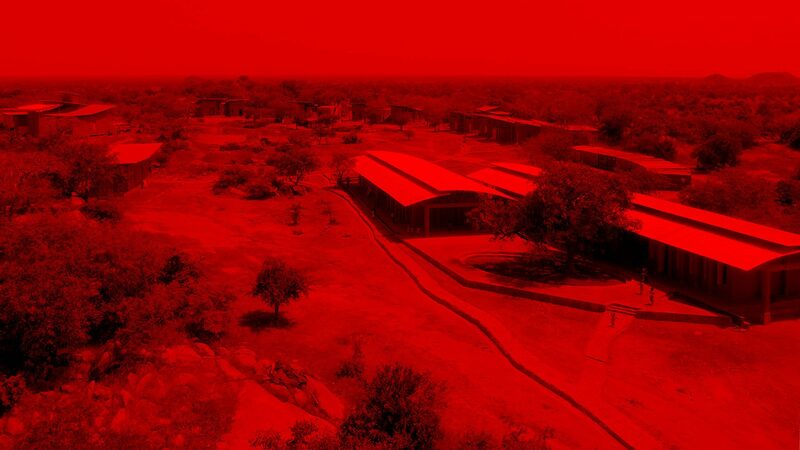 Kéré attaches importance to a sustainable social architecture, under economic and ecologically acceptable conditions: Francis Kéré concept of social construction, involves the people in the construction – all assist. This idea of a ‘social architecture’ met up with Schlingensief’s idea of a ‘social statuary art opera village’. 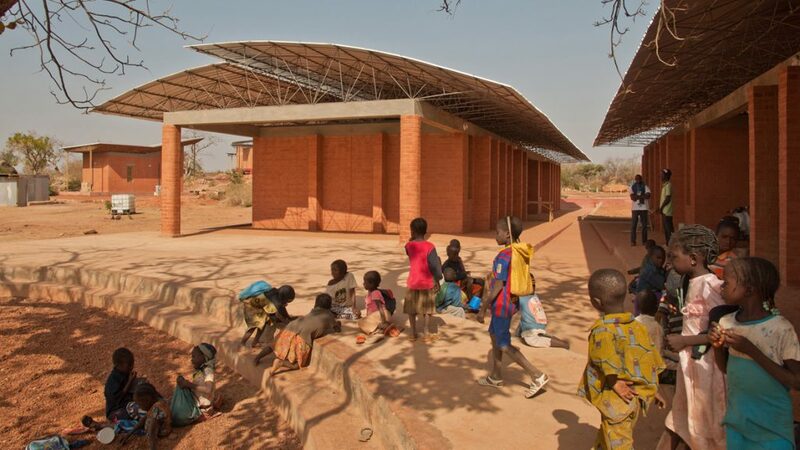 In 2009 Kéré invited Schlingensief to his home village Gando located at a four-hour drive distance from the capital Ouagadougou and showed him his project, a primary school for 500 children, which he had built together with the village residents. a symphony played … that’s not all necessary. My vision of the place has always been coupled with the hope that the place will begin to live in its own right – through the people who live there, most especially through the school. Kéré and Schlingensief mutually recognised each other as partners, for the project Operndorf Afrika. 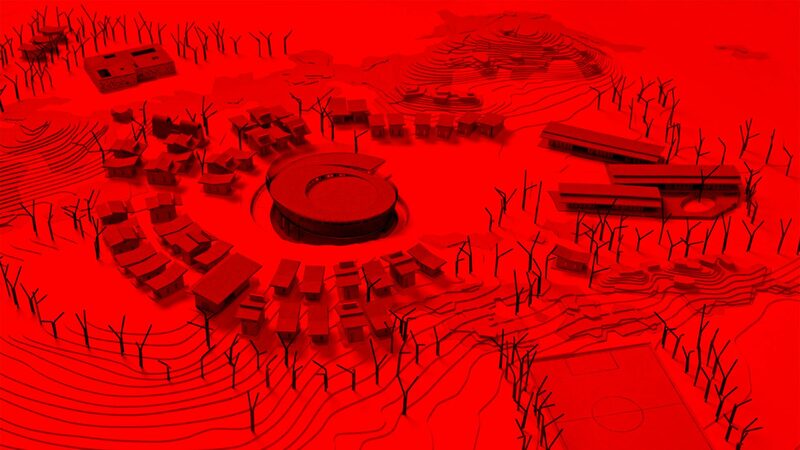 Following the trip to Gando they developed the architectural concept for the Operndorf Afrika. They mutually agreed on the key issues that should accompany the construction of the Operndorf: What do the people expect and need locally? What natural materials exist locally? Kéré has rehabilitated the local use of natural materials, such as clay, sand and stone and combines the traditional construction of his country, with new ecological and sustainable concepts. Clay is available in abundance; however, it has for a long time been regarded as a “poor man’s building material” and not as construction suitable. People know from experience that a clay building does usually not survive a rainy season. Therefore, they strive for expensive and locally difficult to handle, construction materials, such as cement. Kéré has himself developed a technique, which mixes clay so that it withstands the rain – with minimal use of electricity and water and using only about 8 percent of cement. These clay bricks can be produced locally in spite of lack of electricity and water. People can independently construct the projects; locally, as well as also repair them later on. 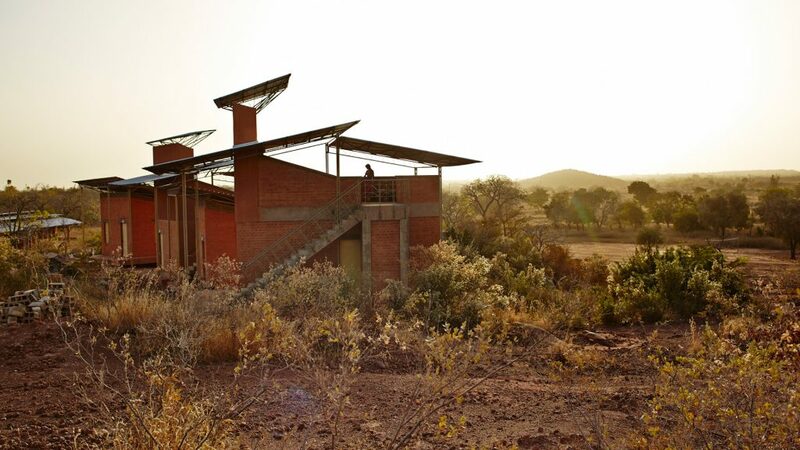 In this way, it is intended to create a functioning organic Operndorf Afrika with a self-sufficient ecological system that guarantees a sustainable management of natural resources. 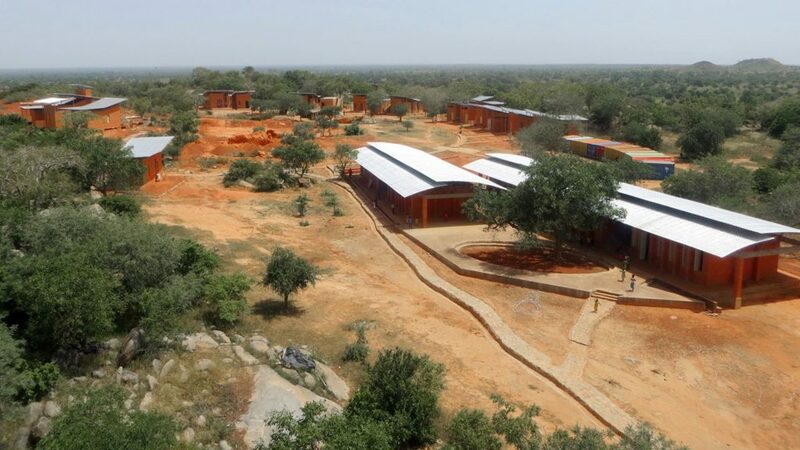 Francis Kéré has designed special building modules for the Operndorf Afrika, according to local possibilities and needs, which guarantee a long-term and versatile use. His climate technology provides for a constant, comfortable ambient temperature without electricity. 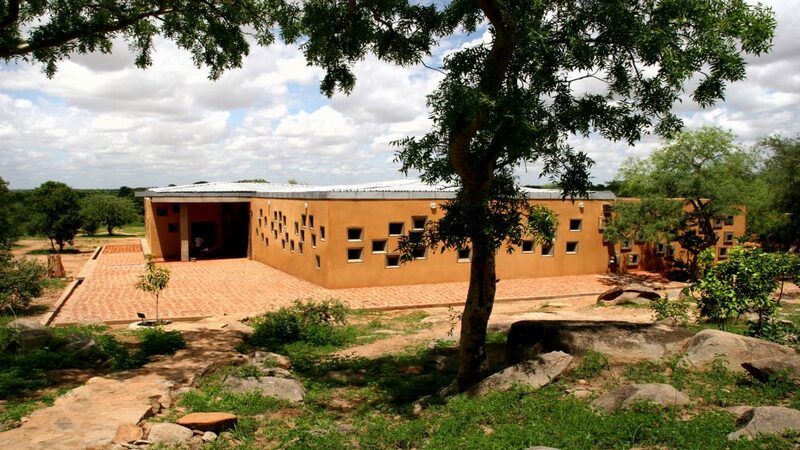 In October 2011, the first project building block of the Operndorf Afrika, a primary school with attached canteen was opened. Due to the architecture that integrates a special and multi-award winning ventilation concept, the rooms are cool and allow for more concentrated learning. The roof construction is comprised of a double roof, which allows for the circulation of air in the rooms. The roof overhang also shades the facade, thus preventing the overheating of the interior space. The upper corrugated roof is supported by a steel structure, which is located on, the massive brick, louvered, BTC-cap ceiling. Due to this dual configuration of the roof, the air between the two layers of the roof can circulate. The rooms are in each case equipped at the front and rear with louvre windows made of metal, which also allows for cross ventilation. Unlike the schools in concrete construction, which are typical in the country, this provides for a pleasant room temperature. This first phase of the project includes a total of 16 constructed buildings (offices, teacher residential houses, a recording studio, two school buildings, a film screening room, art workshops, a canteen with kitchen and dining halls), which are operational since October 2011. In the same year the school project has been connected to the public electricity and water mains, with the support from the Government of Burkina Faso. The expansion of the school to include the last building is scheduled for spring 2017, with expected construction costs, in the amount of 95,000 Euro. Francis Kéré has designed special building modules for the Operndorf Afrika, which guarantees a long-term and versatile use. They can for example be used as, storage, residential or office space. Twenty of these modules have already been realised. In addition to the teachers of the primary school, the staff of the infirmary in the Operndorf Afrika also lives in these residential modules. 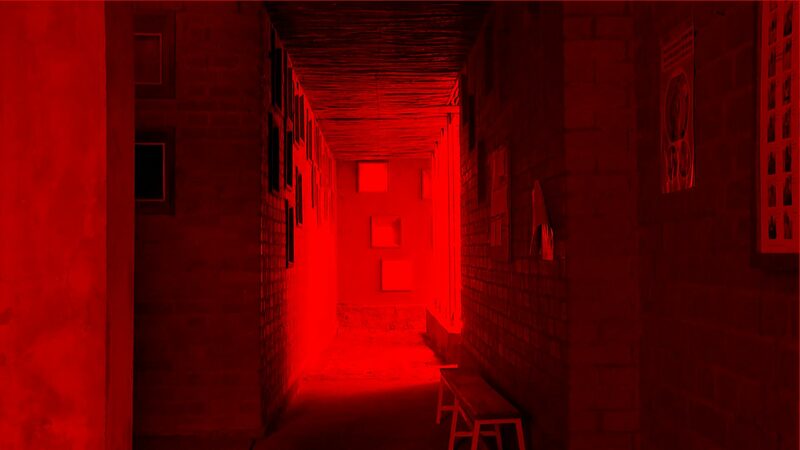 Furthermore, three artists residences were completed in 2014, which have been placed at the disposal of the artists of the Artist-in-Residence program. In addition there are functional modules, which serve as offices and storage facilities, or count as part of the school canteen complex. One of these functional modules has been equipped as a recording studio and has been placed as the disposal of the music class of the Opera Village School. The construction of additional residential and functional models is being planned. Francis Kéré wanted with this new building, to on the one hand create a closed building complex, which with regard to the aspects of health and disease in the Operndorf Afrika, ensures spatial separation, vis-à-vis school, canteen and administrative units. On the other hand, the draft on account of its numerous openings, concomitantly exhibits windows and half roofs in the vicinity of the village and offers a view of the countryside. The 800 square meter building is divided into three areas, with partly separate entrances and exits, through which a smart separation of the working areas of the station is realised. At the same time, this allows for a functional proximity to the general areas of Administration and Pharmacy. The construction in particular has social proximity as its focus, especially for the relatives of the patients and the families of the mothers in labour. In order to not only strengthen the community aspect, but to also provide for space, Kéré integrated partly covered, green courtyards for the families of patients, in which one is provided with the opportunity, to stay, to meet and to cook. 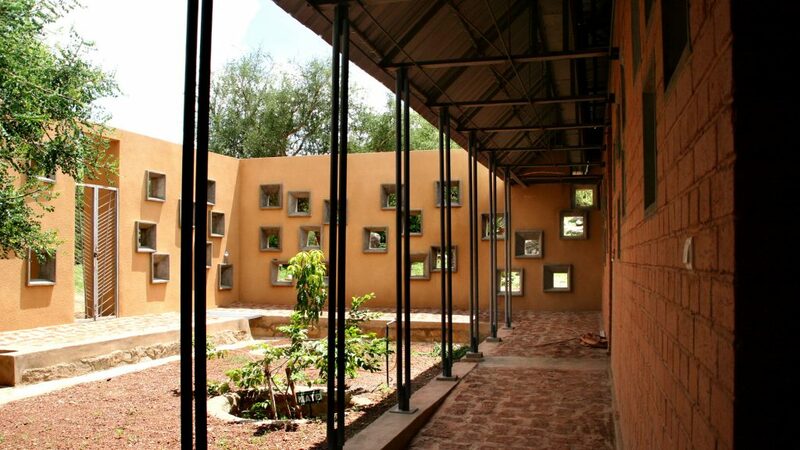 The landscaped courtyards and the seemingly random arrangement of numerous windows and openings at different levels, thereby moreover also pursue a very different purpose: Kéré utilises the effect of exhaust and fresh air to cool the building during the daily temperatures of over 30 degrees, in a natural way. Cool, pre-filtered air, flows over two landscaped courtyards of this infirmary into the building. Smaller, inner courtyards create through openings, an upward chimney effect and thereby transports hot air off again – this as such allows for a natural ventilation system to be created. It has been possible to integrate, three decades old trees into the construction and thus to maintain them, more trees have been given as a gift to the Operndorf Afrika by the surrounding villages and have been planted in the courtyards. The project, which has already integrated the surrounding communities in the construction of the system, has been realised right from the outset as a joint project with the community, the country and the general public. 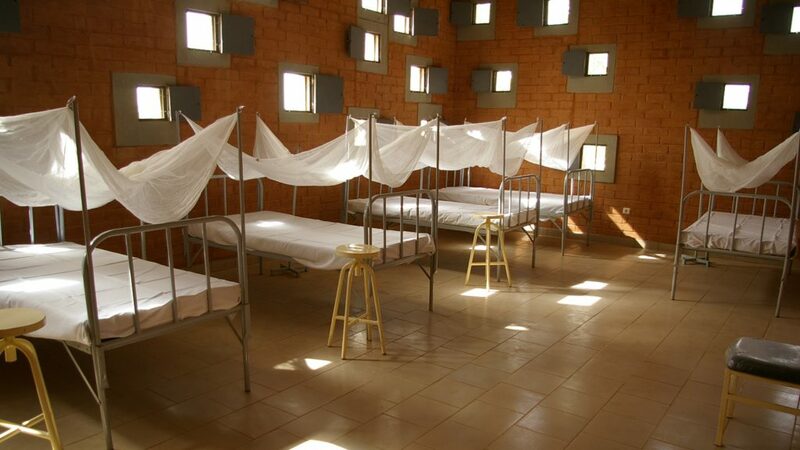 The infirmary includes the areas of an outpatient, a maternity ward and a dental practice. It is since mid-2014 in operation and was realised with the support of the international aid organisation, the Grünhelme reg. association, as well as the Federal Ministry of Economic Cooperation and Development. The festival hall is envisaged to constitute the centre of the Operndorf Afrika and to function as a place of art: It is envisaged that theatre, film and opera performances and other cultural events should take place here, at the same time it should serve as a place, for gatherings and as a meeting place. The festival hall and fairground are located in the direct vicinity of the school, the settlements and the functional modules, in which the residents teach, learn, live and work. This is an arrangement, which should provide for a direct integration of the cultural life in everyday life. The square in front of the future festival hall has already today evolved into a public meeting place and event venue.